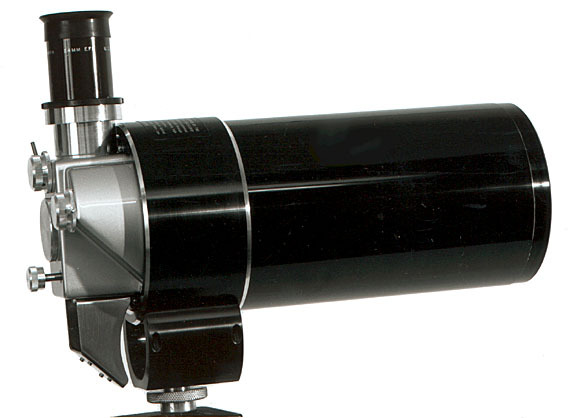 The Questar Field Model is the ultimate spotting scope. For situations requiring long focal lengths, no other scope matches the Field Model's resolution and image contrast. As a telephoto lens, the Field Model is comparable in size to a 250mm f/2.8 lens, and weighs less than 3 pounds. It has all the controls of the Standard 3.5, giving the observer 3 powers per eyepiece and giving the photographer a separate selectable port for the camera attachment. The Field Model is designed expressly for terrestrial observation and photography, yet when mounted on a pan head it can also be used successfully for sky observation. It has the same optic and built in functional control elements as the astronomical units with the exception of the astronomical mount and the moon and star chart barrel covers. The Field Model has the rapid focus option that was developed primarily for the convenience of photographers. It can also serve the wildlife observer by providing a 2.3 times faster acquisition of a target. This modification to the Field Model must be done at the factory. The Questar Field Model 3.5 includes the lens cap, 24mm eyepiece (53-80X), built in finder (4x), stardiagonal prism, Barlow lens for eyepiece port, blue anodized dewcap, basic camera coupling set, and waterproof carrying case. There is room in the case for camera and other small accessories.